Collecting scrap metal from appliances, remodeling projects and junk piles can be a productive way to clean up your home and make some cash while you're at it. And if you're willing to collect other people’s scrap metal, you can turn your efforts into a profitable part- or full-time business. 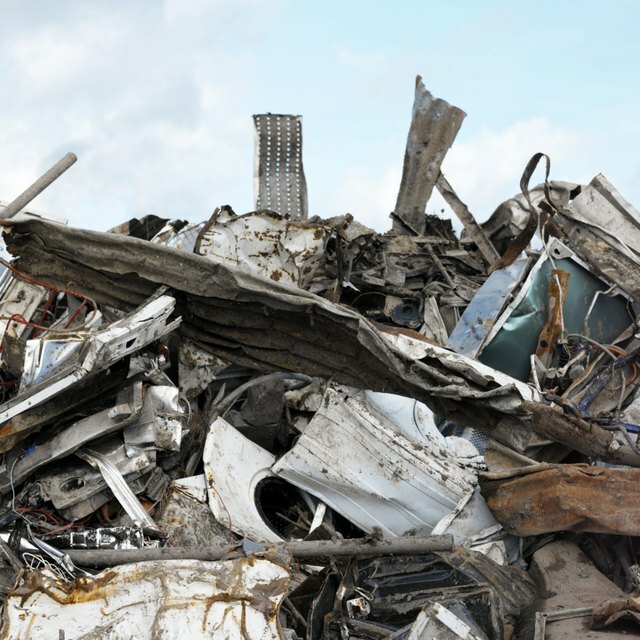 Scrap metal breaks down into two types: ferrous and nonferrous. Ferrous metals include iron and stainless steel, and nonferrous metals include brass, copper, aluminum, tin, titanium and nickel. The prices for scrap metal are driven by a number of factors, including national and international commodities market prices, demand from industries such as construction and electronics and how much you have to sell. Iron and stainless steel tend to fetch the lowest prices, while copper typically is king, fetching the highest price per pound. Finding sources of valuable scrap metal requires looking around your home. To expand your search, let neighbors know you’ll remove their old stuff with metal parts for free. Read through classified ads for people who want appliances removed from their homes and businesses. Develop relationships with apartment managers and tell them you’ll take junk containing scrap metal off of their hands at no charge. If you collect old refrigerators and freezers for the metal, you need a professional to remove the Freon before taking it to the scrap yard. Sort your scrap into piles by the types of metal they contain to take advantage of market prices for certain metals go up. Plus, take piles of specific metals to the scrap yard to get top price, without worrying about less valuable metal in the same pile bringing down the per pound price. Metal weight is calculated at the scrap yard. You’ll drive your vehicle onto a scale to determine the initial weight. A scrap yard worker removes the material from your vehicle, using a magnet to remove ferrous metal from an open-backed pickup or trailer. Otherwise, scrap yard workers use forklifts to remove nonferrous metal. If you use a vehicle with a roof, plan to unload the metal yourself to avoid damage. Once you finish unloading, your vehicle goes back on the scale to get the new lower weight. The difference in weight indicates how many pounds you’ll get paid for. Prices for specific types of metals fluctuate daily and among scrap yards. If you live near a couple of scrap yards, compare prices online or give them a call. In addition, some scrap yards pay a bonus when you bring large amounts of metal, so save up a good-sized pile to get the most money. Some scrap recyclers specialize in specific metals, so do your homework to find out which metals they want and are willing to pay top dollar for. Since the law prohibits scrap yards from paying cash for metal, such companies issue you either a check or a card you can use immediately at an automated teller machine located at the business.